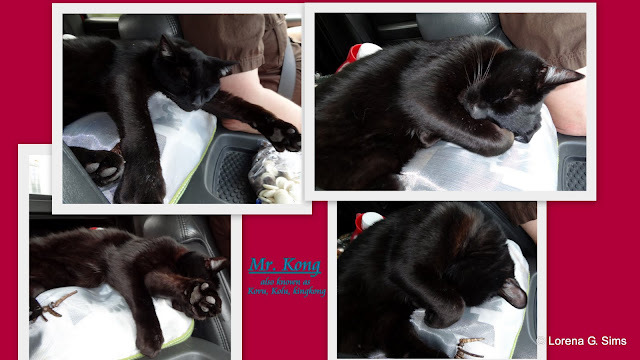 I am so upset and sad that we lost Mr. Kong in Dawson Creek, British Columbia. We spent the night at the Mile 0 RV campground. The thing is, anywhere we go, Mr Kong wonders around but he always comes back. He would whine at the door and won't stop until we let him in. Well, this time he didn't come back or maybe couldn't come back. We look and look for him and waited for few hours but he is no where to be found. He might have gotten into someones RV and got locked in or something. Mr. Kong has microchip so if someone ever turn him in to the found or shelter, they will know who he belongs to. I just hope that he is being feed. I miss him so. Sad, our animals become so much a part of us. We had Mr. Kong for about 9 years. Awwww, I'm sorry Lorena. Mr. Kong looks like a beautiful kitty. How cool that you could share camping trips with you. Fingers are crossed that he shows up somehow. Thanks Cathy, yes it was wonderful that he was able to go camping with us. Your photos are wonderful, full of memories!!! I wich to come back. I am so sorry for your missing cat, I used to take mine camping as she was diabetic and couldn't leave her at home. I do hope your cat returns safe and sound.